No, lens replacement treatment doesn’t hurt. Lens replacement is essentially sophisticated cataract surgery and during the procedure, the eye is completely numbed. It’s numbed with drops and solutions, an anesthetic which completely anesthetizes the eye. Patients may be aware at the beginning of the procedure, when we drape the eye up, in other words, create a sterile field with a transparent drape over the eye, that that’s being applied to the eye. We use a little blink stopper to keep the eyelids open and patients may be aware of that being inserted. But apart from that, the procedure is painless. What patients are aware of is the microscope light because we operate through a microscope and of course to see what we’re doing it needs some light. The light isn’t very bright but when it’s first applied to the eye patients can take a little time to adapt to that light. And then during the procedure, because lots of fluid is applied to the eye what patients are aware of is the light and fluid interacting, almost like a colored waterfall or a kaleidoscope. So that’s what patients are mainly aware of. What we provide for patients who are anxious. We do have patients; more so in the refractive lens surgery group or a younger in the cataract population who feel very anxious and in that group of patients, I will work with an anesthetist who will provide some intravenous sedation. In other words, a very quick acting Valium which is injected into a vein and the anaesthetist will monitor that so that the right amount of anaesthetic sedation is applied to the patient is aware what’s going but not asleep but not properly awake and the beauty of it is, as soon as it’s no longer administered within three or four minutes the patient is completely back to normal as if they’ve not had any sedation. So there is modern day faster acting sedative drugs that are phenomenally effective and they almost switch on and off. The other advantage of them is that it gives patients amnesia so that they can’t remember the procedure and also the patients they have no idea of the time of the procedure. So for the anxious patients and probably about 25% of my patients with sedation, for the anxious patient sedation is a good alternative, a good solution. 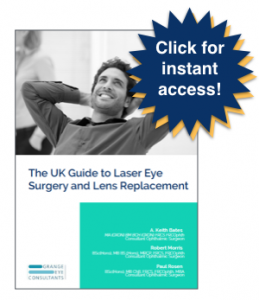 By Grange Eye Consultants|2018-12-31T05:05:07+00:00January 23rd, 2019|Refractive Lens Exchange, Video FAQs|Comments Off on Does lens replacement treatment hurt?